The distant world whose discovery prompted leading astronomers to demote Pluto from the rank of "planet" has now been given its own official name. Eris is larger than Pluto, which put scientists in the fix of having to call them both planets - or neither. 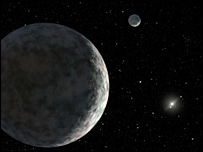 Both bodies have now been put in the new classification of "dwarf planets". Eris' discoverer, Michael Brown of the California Institute of Technology, told the Associated Press that the name was an obvious choice, calling it "too perfect to resist". In mythology, Eris caused a quarrel among goddesses that sparked the Trojan War. 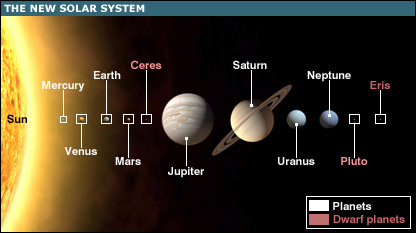 In real life, Eris also caused strife, forcing scientists to produce a strict definition of the term planet - and that eventually led to Pluto losing the status it had held since its discovery in 1930. That prospect proved too much for IAU members who took the historic decision last month to redefine the Solar System. Eris - initially given the codename "Xena" after a TV character - was discovered on 8 January, 2005, at the Palomar Observatory in California. 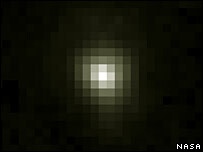 Its exact size is difficult to measure, being small and faint; Brown's team, using the Hubble telescope, found the object's diameter to be just 70km bigger than Pluto's. Another team, using a radio telescope in Spain, has measured Eris to be some 700km larger than Pluto. Eris has a moon, and this too now has an official name: Dysnomia, the daughter of Eris known as the spirit of lawlessness. The "new" Solar System agreed at the IAU's General Assembly has eight planets - Mercury to Neptune - and at least three dwarf planets: Pluto, Eris and the largest asteroid in the Solar System, Ceres. Astronomers opposed to Pluto's demotion have launched a petition to try to get it reinstated.